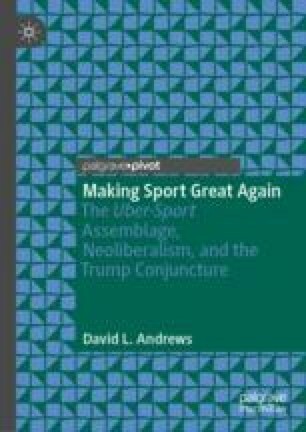 This chapter accents the contingent and contextual nature of the uber-sport assemblage as realized through its co-constitutive relationship with the neoliberal assemblage. The core precepts of neoliberalism as a political-economic-cultural project are explicated, highlighting its ideological assumptions, and affective investments. This leads to an examination of precisely how, and to what effect, the uber-sport and neoliberal assemblages are linked, or articulated together. Deleuze’s notion of an abstract machine explains the function a neoliberalized uber-sport plays in normalizing neoliberal values and commitments. Focusing on different scales and spaces, the discussion examines how the uber-sport assemblage surreptitiously reinscribes the neoliberal preoccupation with consumption, and the nurturing of the individualized consumer subject, and so reproduces neoliberalism’s iniquitous, divisive, and undemocratic properties, and attendant social hierarchies. Chakrabortty, A. (2018, October 17). Britain fell for a neoliberal con trick: Even the IMF says so. The Guardian. Retrieved from https://www.theguardian.com/commentisfree/2018/oct/17/economic-lies-neoliberalism-taxpayers. Dimensional Innovations. (n.d.). Mercedes-Benz Stadium: Sponsor activations. Retrieved from https://www.dimin.com/projects/mercedes-benz-stadium-sponsor-activations/. Forbes Corporate Communications. (2018). Forbes releases 2018 list of the world’s most valuable sports teams. Forbes.com. Retrieved from https://www.forbes.com/sites/forbespr/2018/07/18/forbes-releases-2018-list-of-the-worlds-most-valuable-sports-teams/#4c09e6da75ff. Heitner, D. (2015, October 19). Sports industry to reach $73.5 billion by 2019. Forbes.com. Retrieved from https://www.forbes.com/sites/darrenheitner/2015/10/19/sports-industry-to-reach-73-5-billion-by-2019/#658562931b4b. Levenson, E. (2014). Voters don’t want to pay for sports stadiums anymore. The Atlantic. Retrieved from https://www.theatlantic.com/international/archive/2014/05/voters-dont-want-to-pay-for-sports-stadiums-anymore/371672/. Los Angeles Department of City Planning. (2010). Los Angeles Sports and Entertainment District: Specific plan. Retrieved from https://planning.lacity.org/complan/specplan/pdf/LASED.pdf. Lutz, M. (2017, December 26). Braves stadium hardly a home run for Cobb taxpayers. The Atlanta Journal-Constitution. Retrieved from https://www.myajc.com/news/local-govt–politics/braves-stadium-hardly-home-run-for-cobb-taxpayers/w1PyNelP69O82jY34YyOQJ/. Miles, S. (2010). Spaces for consumption: Pleasure and placelessness in the post-industrial city. Retrieved from http://search.ebscohost.com/login.aspx?direct=true&scope=site&db=nlebk&db=nlabk&AN=372429. Monbiot, G. (2016). Neoliberalism: The ideology at the root of all our problems. The Guardian. Retrieved from https://www.theguardian.com/books/2016/apr/15/neoliberalism-ideology-problem-george-monbiot. Queiroz, R. (2017). From the exclusion of the people in neoliberalism to publicity without a public. Palgrave Communications, 3(1), 34. Retrieved from May 4, 2018, https://www.nature.com/articles/s41599-017-0032-1#article-info. Redford, P. (2018). Cobb County proposes cutting libraries after dumb decision to build the Braves a stadium. Deadpsin.com. Retrieved from https://deadspin.com/cobb-county-proposes-cutting-libraries-after-dumb-decis-1822781704. Saito, L. (2007). Economic redevelopment and the community benefits program: A case study of the L.A. Live project, A Los Angeles Sports and Entertainment District. Retrieved from https://lusk.usc.edu/research/working-papers/economic-redevelopment-and-community-benefits-program-case-study-la-live. Schneider, K. (2018, January 18). Welcome to the neighborhood: America’s sports stadiums are moving downtown. The New York Times. Retrieved from https://www.nytimes.com/2018/01/19/business/sports-arena-development.html. Sherman, N. (2015, September 14). New projects suggest sports and entertainment zone is taking root. The Baltimore Sun. Retrieved from http://www.baltimoresun.com/business/bs-bz-south-baltimore-entertainment-20150914-story.html.